In 2013-16 the RwB, WWF and other conservation groups joined forces with the East Siberia Branch of the Russian Research Institute for Integrated Use and Protection of Water Resources (VostokNIIVH) to develop a comprehensive review of integrated flood management. While seeking to introduce full array of approaches to flood management this book is focusing on Amur-Heilong River transboundary basin and is intended to promote there climate adaptation, ecosystem-based river basin management, strategic environmental assessment of development options related to flood management in transboundary river basins. Unexpectedly this book on Amur floods and integrated flood management won a Bronze medal at Far-Eastern Book Fair-2017 in the nomination "Scientific Monograph". We were not aware that the book was submitted to competition. 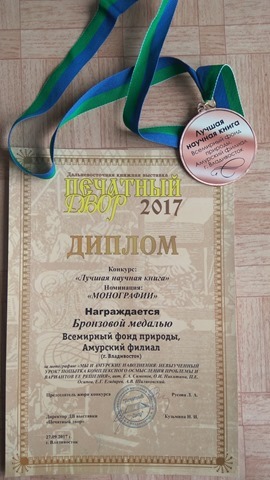 Over 300 titles were assessed by the Jury.This is very unusual that a publication done by NGOs wins in competition with production of commercial and scientific publishing houses. The book was published in Russian and can be downloaded from the WWF Russia web-site. Here you can also download a 26-page SUMMARY in English with detailed conclusions of the flood study. Research and fieldwork on the Amur River and assessment of its floodplains in 2013–2015 was supported by Whitley Fund for Nature, DIPA, the Amur Branch of WWF-Russia, Global Green Grants Fund and others. Report preparation was made possible also by the support from the UNECE Convention on the Protection and Use of Transboundary Watercourses and International Lakes and enhanced by our participation in the Second workshop on transboundary floods management supported by the UNECE and WMO. Some ideas set forward in this book emerged or were discussed due to our participation in Sino-Russian working groups on biodiversity and Amur Flood to which we were invited by Russian agencies. Sincere thanks to all institutions and individuals who contributed to this long process!! !